Twelve months ago, I welcomed the year 2010 from the balcony of a friend's West Side Manhattan apartment, watching the midnight fireworks over Central Park. For all I knew at the time, I would have expected to be back there again tonight - in the same place, celebrating with the same friends. Instead, my 63rd New Year's will likely find me sitting alone in front of the TV in the old Victorian house that has since become my home here in Knoxville. Taking my cue from the venerable Roman tradition of marking the end of the year with the singing of the Church's ancient hymn of thanksgiving, the Te Deum, I suggested to the congregation at mid-day Mass today that spirit in which to approach New Year's Eve should be primarily one of thanksgiving. To me, New Year's is always ultimately an invitation to hope (as I will suggest once again in my New Year's Day homily tomorrow). Hope, however, has to be based in something substantive, lest it be just optimism, which is another animal entirely. That something, for me, can only be the experience of grace. The state of the world at the end of the 1st decade of the 3rd millennium is perilous to be sure - more so perhaps than it seemed even a short decade ago, before 9/11, two wars abroad, and the continued deterioration of of our civic community at home. Even so, the human story continues and the evidences of grace are abundant to all those disposed to discern them. And so it is in a spirit of thanksgiving - with genuine joy and gratitude to God - that I look back on this soon-to-expire Year of Our Lord 2010, the year of my first "tender Tennessee Christmas." And to all who have been a part of my life especially this year - family, friends (especially old friends in New York and new friends in Knoxville), brother priests, fellow Paulists, co-workers in the mission - I wish you all a very blessed and happy new year 2011. On this day 18 years ago, during my first visit to England – a London-based week with a friend from high school - I attended Evensong at Canterbury Cathedral on this feast of St. Thomas Becket (1118-1170), the Archbishop of Canterbury who was martyred at Vespers in his Cathedral on this date. In 1992, it was Becket’s Anglican successor as Archbishop of Canterbury who led the celebration of Evensong, the highlight of which came at the end of the service when the Archbishop led the congregation down to the exact site of St. Thomas’s murder, where we listened to a contemporary medieval account of the famous event. Canonized within three years of his death, Becket rose to become one of the Church’s great heroes in the perennial conflict against the ambition of secular power. Famously, his shrine at Canterbury also became one of medieval Europe’s popular pilgrimage sites. Sadly, that shrine – his burial place in Canterbury’s Trinity Chapel – is long gone. A new pharaoh, Henry VIII - much more ambitious to control the Church (and everything else) than Henry II had been or probably could ever even have imagined being – destroyed the shrine (and the saint’s relics) in 1538. (A candle now burns on the bare floor marking the site of the former shrine, and a modern altar adorns the location of his martyrdom). The issue which precipitated the conflict between Henry II and his long-time friend is hardly one which would likely endear Becket to too many modern audiences. It involved “benefit of clergy,” the right of medieval clerics to be tried exclusively in church courts rather than civil courts. The underlying principle, that the Church represents a claim on people’s consciences superior to that of any state, still has some resonance in some quarters – but likely less and less. The words of one of Becket’s killers – “No faith, nor subjection do I owe you against my fealty to my lord the king” – have echoed continually through the centuries, seldom louder perhaps than in this most recent one. The commemoration of St. Thomas Becket’s martyrdom on this 5th Day of Christmas is a serious reminder – amidst all the sentimentality of this season – that the world into which God has become human is a dangerous and challenging world, one in which saying “Yes” to Christ inevitably means saying “No” to (at least some) other options. I don't generally think of myself as a movie critic - except insofar as everyone is. But I do like movies and they have become one of my main recreations in my old age. Today, I finally got to see The King's Speech. It's been in limited release in certain cities since late November, but here in Knoxville only since Christmas Day. I had, in fact, originally planned to go and see it late on Christmas Day, but our "White Christmas" intervened, and I thought better of it. Today is bitter cold, but no snow or sleet or ice. So, after the noon Mass, I drove to the only movie theater in reasonable distance that was showing it. It was worth the wait. All the actors turned in great performances, but especially the two principals - Colin Firth as "Bertie"(HRH, the Duke of York, later King George VI) and Geoffrey Rush as his idiosyncratic speech therapist, Lionel Logue. Helena Bonham Carter also does a great job at the Duchess of York, whose actual historical role in helping her husband was even greater than is obvious in the film, which is largely focused with the dynamic of the personal relationship between the therapist and his royal patient. Apart from a few dubiously historical minor scenes (e.g., a conversation with Winston Churchill that hardly reflects the historical fact that at the time Churchill was more a supporter of Edward VIII), the film rings true to what is known historically. The true story of a man of limited talent from whom little was expected, - a man utterly lacking in charisma and used to being overshadowed by his glamorous elder brother, but loved by his supportive wife and children, who overcomes his limitations through heroic effort - such a story, if well told and acted, is the sort of story almost certain to be well received. That it is a true story and that it mattered not just for one man and his family but for a nation on the verge of a war for its very survival give it a grandeur that goes beyond sentimentality. In the process, it provides a useful civics lesson on duty - highlighted by the contrast with the glamorous but unworthy older brother, King Edward VIII. Finally, the film highlights how modern technology - radio, then - has impacted political leadership and burdened it with the expectation of celebrity and personal charisma, a development that has been vastly exacerbated in the 65 years since the end of the war. Since this was, after all, the "greatest generation," duty, dedication, and integrity trumped celebrity and charisma (and Western Civilization was saved in the process). Could that happen today? Back when the Christmas season really began on December 25, the 12 days from Christmas until Epiphany Eve really were "the 12 Days of Christmas." Today is, of course, the 2nd Day of Christmas. In the song, one's "true love" (God) is supposed to give one "two turtledoves" (representing the Old and the New Testaments) today. Mainly what we've gotten here in Knoxville today has been more snow, which has made this "tender Tennessee Christmas" the whitest Christmas in years. In Canada, where I was for six happy years, the day after Christmas is called "Boxing Day," after the British fashion. In those Catholic countries where December 26 is still holiday, I presume it is known as "St. Stephen's Day," after St. Stephen, the first martyr, whose feast day it normally is. Since 1969, the Roman calendar has assigned the feast of the Holy Family (previously celebrated in January) to the Sunday between Christmas and January 1. 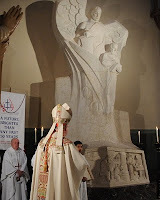 So that is what the hardy worshippers who made it to Mass got to observe today. It's a thoroughly modern, notional feast - dating back only to Pope Leo XIII's 1892 Apostolic Letter Neminem Fugit, which dedicated Christian families to the Holy Family. In an age when so many social institutions increasingly seem to be in disarray, there has been a corresponding impetus to uphold somehow the primordial institution of the family. Of course, the modern "nuclear family" (one father, one mother, and one or more children biologically belonging to that couple) is only one representation of the more complex and varied experience of "family" in human history, and even today may appear less and less typical in this age of divorced and "blended" families, single-parent families, unmarried straight couples (with or without children), gay couples (with or without children), etc. For most of human history, the family unit (whether "nuclear" or "extended") has served as the fundamental social institution through which society institutionalizes its commitment to the next generation - an important value for any community which hopes to have a future. In all the current noise about the form and structure of family life, that is a value no society can afford to lose sight of. That said, of course, for Jesus - and, therefore, for the Church - the kingdom of God takes us beyond the immediate inter-generational social unit of the family and commits us to a larger community in which our new relationship with one another in Christ entwines us in a whole new network of relationships, necessarily wider and more inclusive than any family unit. Situated at the heart of the Christmas season, the contemplation of the Holy Family fits easily into the family-centered sentiments that are so much a part of our contemporary Christmas. But it also invites us to consider the great theme of the incarnation, what Christmas is ultimately all about, the divine Word becoming part of our fragile and (as today's gospel illustrates) frightening world as one of us. Born into a human family, with a mother and an adoptive father, Jesus highlights for us the significance of the ordinary, day-to-day networks of relationships of which we are a part - and must be part of if we are to survice in our world. It is within families of all shapes and sizes, as well as other sorts of relational networks revolving around work, neighborhood, nation, etc., that we must live now so as to become who we will be in eternity. “Christmas comes but once a year – which is unhappily too true, for when it begins to stay with us the whole year round we shall make this earth a very different place.” So spoke the narrator in one of Charles Dickens Christmas stories, The Seven Poor Travellers. As with all good Christmas stories – including the more familiar Dickens story A Christmas Carol – while a lot happens during the night, it’s on Christmas morning when it all seems to come together. When I was growing up, Christmas morning followed a set, perfectly predictable pattern. It was a ritual really. We kids got up, bright and early, and woke up our parents. Then all of us (including my grandmother, who as always was awake and up before any of us) went into the living room, lit the Christmas Tree, and immediately began opening the abundance of presents so neatly arranged under and around the tree. Before long, there were gifts - and torn wrappings and ribbons - all over the place. After that, it was time to get dressed and go to Mass, then breakfast, then more time with our toys, before bundling up for the trek to Westchester for an Italian Christmas feast at my uncle’s mansion. (It was actually a typical 1950s suburban home. But, since my uncle was the only relative around, who actually owned his own home, it seemed like a mansion to us). Now, of course, we all know how difficult opening our “shut-up hearts” can be. Hence the perennial appeal of every Christmas story that confirms Christmas’s peculiar power to do just that – whether for Ebeneezer Scrooge in Victorian London or the Grinch in 20th-century Whoville. In my own favorite Christmas movie, Miracle on 34th Street, Kris Kringle somehow gets all sorts of people to believe in him and be reconciled with one another – simply by doing just the sorts of things all those other people would have been completely incapable of doing on their own, had it not been for his presence in their lives, changing their entire world. Christmas – the authentic Christmas that unites us together in this church this morning – challenges us (to paraphrase C.S. Lewis) to believe that, in a world like ours, the Son of God became a man – and then to imagine what must happen as a result! We already know – all too well – what would happen in our world without him! How much have you loved us, kind Father, exclaimed St. Augustine. If your Word had not become flesh and had not dwelt among us, we would have had to believe that there was no connection between God and humanity and we would have been in despair. At best, we would have been like the merchants in Miracle on 34th Street (and all the other ordinary people in the film) completely incapable of opening up our “shut-up hearts,” desperately in need of someone special to do it for us. Christmas challenges us to believe that the Son of God is really present in our lives, transforming our world, doing it for us – and then to act on that belief and imagine what must happen as a result! Christmas challenges us to believe what we just heard in the letter to the Hebrews – that God has in these last days spoken to us through his Son, through whom he created the universe and who sustains all things by his mighty word – and then to imagine what must happen as a result! Christmas challenges us to believe (if I may quote St. Augustine one more time) that he who is the great and eternal day came from the great and endless day of eternity into our own short day of time – and then to imagine what must happen as a result! Christmas challenges us to act on the belief that all this has already happened – that God has spoken to us through his Son, that the Word has become flesh and does dwell among us, in our own short day of time. “Going through the woods,” he continued, “the softness of my tread upon the mossy ground and among the brown leaves enhanced the Christmas sacredness by which I felt surrounded. … I came to the village, and the churchyard where the dead had been quietly buried, ‘in the sure and certain hope’ which Christmastime inspired. What children could I see at play, and not be loving of, recalling who had loved them! No garden that I passed was out of unison with the day, for I remembered that the tomb was in a garden … In time, the distant river with the ships came full in view, and with it pictures of the poor fishermen, mending their nets, who arose and followed him, - and of the teaching of the people from a ship pushed off a little way from the shore, by reason of the multitude, - of a majestic figure walking on the water, in the loneliness of night. My very shadow on the ground was eloquent of Christmas; for did not the people lay their sick where the mere shadows of the men who had heard and seen him might fall as they passed along?" Among us too, this Christmas morning, the kingdom of God is being born, breaking into our otherwise ordinary and self-enclosed world and offering it the precious possibility of hope. So, when the last carol has been sung and we disperse from here to our happy homes and holiday meals (or, perhaps, as so many in our world, to a somewhat sad or lonely home or a modest, maybe even meager meal), may that same precious and powerful hope move us - and so transform our frustration into fulfillment, our sadness into joy, our hatred into love, our loneliness into community, our rivals and competitors into brothers and sisters, and our inevitable death into eternal life. All this, because we have seen his glory, the glory of the Father’s only Son, full of grace and truth. 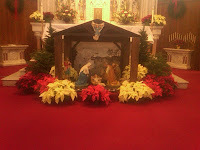 Homily for the Mass of Christmas Day, Immaculate Conception Church, Knoxville, TN, December 25, 2010. 35 years ago – Christmas 1975 – when I was in graduate school in New Jersey, a foreign student classmate took the bus into New York City for Christmas Eve Midnight Mass at St. Patrick’s Cathedral. When he got there, he was told the Cathedral was full and that he should try one of the other many midtown churches. When he told me the story a week later, he was still amazed that all the people, who had been patiently waiting to get into the Cathedral, had accepted this so calmly and gone away peacefully. “In my country,” he said, “there would have been a riot.” Coming from a different culture, he was surprised – amazed – that Americans were so orderly. Notice, however, that he seemed not at all surprised – or amazed – by the size of the crowd. But why not? Why would people come out in such numbers on a cold New York winter night – in the middle of the night, no less, and to go Church, of all things? Why, indeed? Why, indeed, are we here tonight? Some 20 years later, a priest I know had occasion to visit a remote Pacific island. When the people there learned he was a Catholic priest, they welcomed him enthusiastically. And then they asked him to talk to them about Jesus. They told him how, before they had been evangelized, they had been afraid of all sorts of things – both physical and spiritual, natural and supernatural. Now, however, they understood that God – the true God – is bigger and more powerful than all those things that used to frighten them, and at the same time is small enough to be one of us. And so they were no longer afraid. And that is why we are here tonight! Now, of course, as we all well know, people approach the celebration of Christmas in a variety of ways and with a variety of emotions. Some still come to Christmas with the same excitement they had as children awaiting Santa’s arrival. Others come trapped in the cynicism of Ebeneezer Scrooge. Some are worn out from shopping. Others just can’t wait for the post-Christmas sales. Some are sad; others elated. Some are preoccupied and distracted; others tranquil and calm. Christmas makes some people all “joyful and triumphant.” Others get nostalgic and weepy. (I, for one, still can’t quite make it through a recording of Judy Garland singing Have Yourself a Merry Little Christmas without at least a tear or two). To all of us, however, whatever our feelings and however mixed our motives, the message of Christmas is one and the same: Do not be afraid … For today in the city of David a savior has been born for you who is Christ and Lord! Do not be afraid! Well, that’s surely easier said than done! Even the shepherds, so we’re told, were struck with great fear. And who wouldn’t be? Like those Pacific Islanders, we all know that there is a lot to fear in life, and how afraid we can be, and how hard it can be for us to believe that anything at all (let alone something so ordinary as a baby being born) can really remove our fear. In fact, as babies’ births go, this one seems to have taken place under less than optimal conditions – away from home, with no family or friends to help or even visit, just strangers, shepherds, of all people! But now, because of Christmas, we do have an alternative. Hence the angel’s reassuring words to the shepherds: Do not be afraid! We heard those words this past Sunday, spoken by the angel to Saint Joseph. We will hear them again at Easter, from the mouth of the Risen Lord himself, the same Risen Lord whom we encounter whenever we celebrate the Eucharist. The fact that we celebrate Jesus’ birth not with a birthday cake, but with the Eucharist, the body and blood of the Risen Christ, signifies that this is not some nostalgic bit of playacting, and that the baby whose birth we are celebrating is not some distantly ancient historical figure, but the presently alive God-made-man – now risen from the dead and living forever at his Father’s right hand. “Christmas comes but once a year,” lamented the narrator in one of Charles Dickens’ Christmas stories. I think Dickens put the emphasis on the wrong part of the sentence. The point is not that Christmas comes only once a year, but that it comes – year in, year out, in good times and in bad, in prosperity and in recession, in peacetime and in wartime. The Christmas story is a proclamation. It is a proclamation of God’s infinitely powerful presence and action on our behalf in our human history – announced by angels to shepherds and proclaimed ever since by the Church, whose main mission and purpose is to announce this good news to all, to proclaim Jesus Christ by words and actions and so be his instrument in the world. Thus, Saint Paul proclaimed to Titus that the grace of God has appeared. God’s gift of his Son – the 1st Christmas gift – has been given to us and stays with us, casting out fear and filling us with hope – hope in the appearance of the glory of our great God and savior Jesus Christ, who gave himself for us to deliver us. The language of hope seems especially powerful to us at Christmas. At no other time of the year are our homes and streets and cities so beautiful. At no other season does the world seem so bright and hopeful as it does at Christmas. At no other time of the year are people so ready and receptive to the hopeful message contained in the sights and sounds and symbols of this season. So let us not be afraid to let the Christmas story speak to us in all its power – and, then, let us not be afraid to let that same Christmas story speak to the world, through us, in all its power – the power of the glory of our great God and savior Jesus Christ, who gave himself for us to deliver us. Let us not be afraid to accept this Christ, to conceive him in our hearts as Mary did and to bring him forth into this confused and frightened world as Mary did. Let us not be afraid to identify ourselves fully with his Church, that network of friendship with Christ, uniting heaven and earth, spanning space and time, uniting peoples and cultures, past, present, and future, in one communion of saints. Let us not be afraid to let the power of Christ in us make a real difference, not just in some things, but in everything. So, then, when the last carol has been sung, and we leave this warm, bright church and go back out into the cold and dark, Christ’s light will shine – through us – and we will light up the dark winter of our world with a light full of love, a love full of joy, the joy that the angel brought to the shepherds, the joy of knowing that, because of Christmas, we need never be afraid again. And, then, what a wonderful difference Christmas will make, not just today and tomorrow, but every day, all the year, every year! 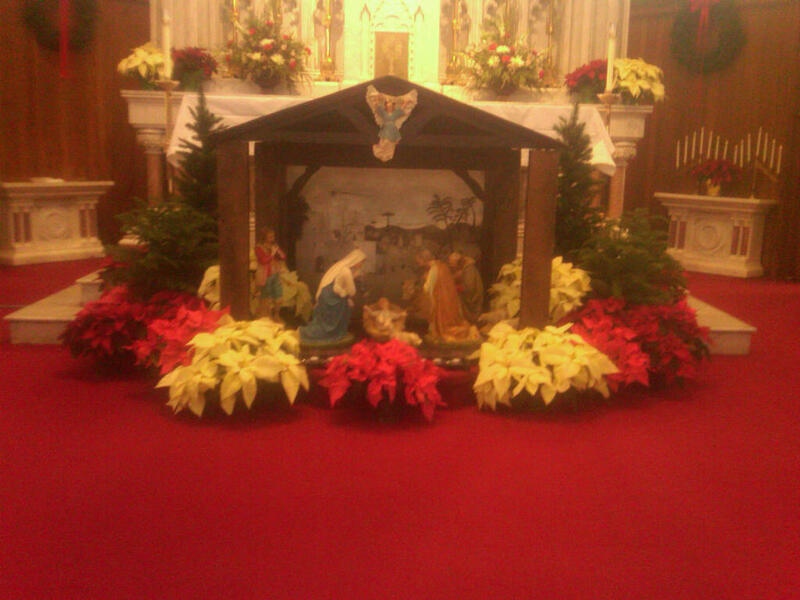 Homily at Midnight Mass, Immaculate Conception Church, Knoxville, TN, December 25, 2010. It’s Christmas Eve - at last! Yet, as Christmas Eve more and more seems to take on the character of Christmas Day (and, sadly, seems to be becoming a substitute for Christmas Day in terms of Mass attendance), the day before Christmas Eve seems in turn to be taking on more of the traditional feel of Christmas Eve. It certainly felt that way yesterday, especially as evening came and we were all home, watching yet another version of the ever-powerful story of Scrooge on the TV. My guess is that everyone has his or her favorite Christmas movie. Mine will always be Miracle on 34th Street - for the rather personal reason that I owe my very existence to Macy’s Department Store in New York City. My parents were both employed by Macy’s in the autumn of 1946 when they met there at a soap sale – the first such soap sale after the war. For my father, it was love at first sight. Their first date was Radio City’s famous Christmas Show. While they waited in line, my father serenaded my mother, singing All the Things You Are – to the delight of those standing on line with them and (more importantly) to the delight of my mother. (They were engaged just before Christmas, and my mother received her engagement ring at the famous St. Francis of Assisi Church, near Macy’s). Two months later, they were married in my mother’s parish in the Bronx. As Macy’s employees, my parents (along with many others) sat under the lights for what seemed like forever as invisible parts of the background crowd for the cafeteria scene in Miracle on 34th Street. Christmas movies often feature otherworldly kinds of characters – Dickens’ Spirits of Christmas Past, Present, and Future, for example. In Miracle on 34th Street, Kris Kringle may indeed be Santa Claus, but he lives in a residence for senior citizens on Long Island. While he accomplishes a tremendous transformation in the people who get to know him, he does so in an ordinary, human way –doing the sorts of good things those other people would never have done had it not been for his presence in their lives. Like Kris Kringle, but to an infinitely greater degree and on an infinitely greater scale, Jesus Christ, whose birth we celebrate at Christmas, changes the lives of all who will let him. He reveals what it means to be human and enables us to be and to do what we would never have been or done on our own, had he not become one of us. He reveals to us and enables us to reconnect with the God who is so in love with us that he has chosen to be one of us. The Christmas story is the story of God’s own Word, becoming what he himself had created, truly God and truly human, Emmanuel, God-with-us. This is the Christian story, the orthodox Christian faith, which we profess, proclaim, celebrate, and share with the world – at Christmas and all year round. 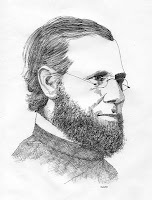 Today is the 122nd anniversary of the death of Paulist Founder, Servant of God Isaac Hecker, who died at the Paulist Mother Church in New York City on saturday, December 22, 1888. In his eulogy at Hecker’s funeral four days later, the Jesuit Provincial recounted the scene at Hecker's deathbed, when his fellow Paulists asked for his final blessing: Hecker "roused himself from the depth of pain and exhaustion, and his ashen lips which death was sealing pronounced the singular words … 'I will give it in the shadow of death.' His feeble hands were raised, and like a soldier dying on the field of battle he reconsecrated his followers in the name of the Father, Son, and Holy Ghost for the struggle in which they had chosen him as Leader." I've always liked that account of Hecker's final blessing. As a Paulist, I feel included in that blessing and so have reason today to be especially grateful for the holy life and heroic ministry of Isaac Hecker. For much of the first 25 years of his life, Hecker had been what today might be called "spiritual but not religious." He was a spiritual seeker, searching for God in the various competing paths available in 19th century American society. In 1844, he finally found what he had been looking for and entered his new spiritual home in the Roman Catholic Church. Having found the object of his spiritual search, Hecker, now no longer a seeker himself, devoted the rest of his life to helping others find what he had found in the Church. In his later years, Hecker summed it all up in these words from a letter to a friend: "How does Father Hecker? In body? Not so well for several months, but now improving. In spirit? Living and working in the dawning light of an approaching, brighter, more glorious future for God's Holy Church. A future whose sun will first rise on this continent and spread its light over the world." This year, the darkest date of the year will be even darker than usual, thanks to the occurrence of a lunar eclipse, beginning around 12:30 a.m. tomorrow. Lunar eclipses happen with some frequency, but tomorrow's will apparently be the first recorded lunar eclipse to coincide with the winter solstice since 1638. (There will be a shorter wait for the next one on December 21, 2094 – but I am not expecting to be around for it!). The lunar eclipse certainly adds something to the experience of the longest night of the year. Unlike Easter, however, which is directly dependent on the cycle of the moon as it intersects with the solar cycle of the seasons, Christmas itself is connected solely with the solar cycle and specifically with the winter solstice. The 4th century assignment of the Roman Church’s celebration of Christ’s birth to December 25 is widely believed to have been a successful adaptation of a pre-Christian Roman winter solstice festival. This was not the famous Saturnalia – a week-long Roman festival of revelry and merriment that began on December 17 and has contributed much to our treasury of Christmas traditions – including gift-giving and evergreen decorations. It was, however, a more explicitly winter solstice festival on December 25, “the Day of the Birth of the Unconquered Sun” (Dies natalis solis invicti), itself introduced into the Roman imperial calendar relatively late (in A.D. 273), that likely became the basis for the Roman date of Christmas. (In the Julian calendar in force until the 16th century’s adoption of the Gregorian calendar, December 25 was reckoned as the date of the winter solstice). The winter solstice is, by definition, the darkest day of the year – the shortest day and the longest night. Very quickly after the solstice, however, one begins to notice how the days start gradually getting longer. Hence, the two key elements of the festival’s title – the birthday of the unconquered Sun. With the 4th century triumph of Christianity over Roman paganism, it was a simple step to replace the celestial sun with Christ the Lord. But for you who fear my name, there will arise the sun of justice with its healing rays [Malachi 3:20]. The brilliant illumination of our homes, streets, and city skylines during this darkest time of the year apparently taps into something deeply rooted in human experience throughout the northern hemisphere. The fear and anxiety associated almost universally with long, dark nights are fought off by our holiday lighting - symbolic of the more substantive victory of Christ, the light of the world [John 8:12] whose birth we celebrate in lieu of celebrating the winter solstice. As I said in my homily yesterday, there is a good reason why we don’t celebrate Christmas in June, when the sun is high and the days are bright and long - why we celebrate Christmas in December, when the days are dark and short. For we celebrate Christmas in a chaotic and perplexing, often threatening and frightening world, where the bright light of God’s own life among us seems hidden in darkness (like Joseph’s dream). Jesus Christ, the sun of justice and the light of the world, is, however, God’s dream for the salvation of the world, the divine dream that brightens even the densest darkness. That is why Christmas remains so necessary, as well as wonderful. This story of St. Joseph [Matthew 1:18-24] always makes me think of my grandmother, who was born in Sicily in the late 1870s and died in New York City in 1967. She gave birth to a total of 9 children, of whom 6 survived to adulthood. But there were 3 boys, each of whom had Giuseppe (Joseph) as one of his names, and each of whom died within 1 year of his birth. Having lost 3 sons in succession, my grandmother took out some of her anger on St. Joseph. “Mai piú chiameró un figlio doppo San Giuseppe,” she’s supposed to have said. (“Never again will I name a child after Saint Joseph!”) In fact, she decided not to name her next child at all. Whatever day he or she happened to be born, that day would decide the name. And so it happened, that her next child was born - on March 19 (the feast of Saint Joseph) – my Aunt Josephine. After that, my grandmother remained faithfully devoted to saint Joseph, and not a day went by without her lighting a candle in church in front of his statue. That I stand before you here today as a priest, I have little doubt, is one of the many blessings bestowed on me, thanks to those decades of countless candles illuminated by my nonna’s fervent prayers to San Giuseppe. We know next to nothing about Saint Joseph. We know he was descended from King David. There were, of course, plenty of other people around also descended from David. Royal ancestry did not somehow single Joseph out in his society as someone special. But it was still extremely important, because being legally Joseph’s son made Jesus David’s descendant too, thus fulfilling the requirement that the Messiah must come from the royal family of David. But, as today’s gospel so poignantly makes clear, Jesus was biologically Mary’s son, not Joseph’s. Joseph may have had the greatest of ancestors, but his son was not his own. So where exactly does that leave Joseph? He never says so much as a single word in any of the gospels. What he does is dream. True, the gospel says it was the angel of the Lord who appeared to him in a dream. But it was still a dream. The contrast with the familiar story of the angel’s appearance to Mary is striking, isn’t it? Mary even got to talk back and ask a question! Joseph just had a dream. But, when he awoke, he did as his dream directed. Now prior to all this, Joseph had presumably been leading a relatively normal-seeming life, with normal expectations. The gospel calls him a righteous man, which means he faithfully lived according to the Old Testament Law of Moses. Presumably, he expected to live by the Law and be enlivened by it in return. Then, all of a sudden, what was expected was taken away, and all his hopes for the future seemed to fall apart. Being a righteous man meant no marriage now (at least not to Mary). His most precious relationship had been ruptured in the most unexpected way. What a jolt that must have been! But Joseph still loved Mary, and struggled with what he should do. And God was with that love, hidden in Joseph’s dreams. Even so, how confused and perplexed must he have been by what had happened! How confused and perplexed must he have been as he struggled in the dark, trying to decide what to do, wondering what had happened to all of his plans and hopes! Joseph here stands for everyone who’s ever been confused or perplexed, living from day to day wondering what will happen next, doing the best one can in situations which are bigger and stranger than we can ever understand. Of course, God was already present in Joseph’s situation. We might even say that God was literally “starting to show” in Mary. But God’s growing presence in Mary’s womb was not what anyone was expecting and was not necessarily so welcome. Joseph’s dream was just as unexpected – and confusing. It didn’t conform to the Law. It didn’t even conform to common sense. Just imagine Joseph waking up and explaining how he’d decided to marry Mary anyway – all because he’d had a dream! Joseph’s dream defied common sense, but it did repair his relationship with Mary – and so set the stage for the salvation of the world and the repairing of all its ruptured relationships. We don’t celebrate Christmas in June when the sun is high and the days are bright and long. We celebrate Christmas when the days are dark and short. And we celebrate it in a chaotic and perplexing, often threatening and frightening world, where the bright light of God’s own life among us seems literally little more than a dream. The marriage of Mary and Joseph was a marriage built on a dream – but a dream which brought to birth Jesus Christ, God’s dream for the salvation of the world, the divine dream that brightens even the densest darkness. This Christmas, let us join Joseph in his dream. And, when we awake on Christmas morning, let us also do as the angel of the Lord directs. Homily for the 4th Sunday of Advent, Immaculate Conception Church, Knoxville, TN, December 19, 2010. I began my Saturday morning homily with those familiar words of Hecker's - fittingly enough since today's Gospel (which is also tomorrow's) includes Matthew's reference to Isaiah 7:14: "the virgin shall conceive, and bear a son, and they shall name him Emmanuel," a word which Matthew then translates as "God is with us." Hecker's words were especially appropriate this morning because, of course, today is the 191st anniversary of Hecker's birth on December 18, 1819. Hecker's spiritual search as a young seeker was all about finding the God who is with us. Having found him in the Roman Cahtolic Church, Hecker devoted the rest of his active life to helping others like himself to find Emmanuel also. While still a Redemptorist misisonary, Hecker wrote two apologetical books, Questions of the Soul (1855) and Aspirations of Nature (1857). His purpose in writing them "was to explain the Catholic religion in such a manner as to reach and attract the minds of the non-Catholics of the American people." In furtherance of that goal, Hecker eventually founded the Paulist Fathers in 1858. The evangleizing mission of the Paulist community was immediately incarnated in their first parish - St. Paul the Apostle in Manhattan. Shortly after the first church on the site was opened, the parish began its first Paulist mission - from December 18 to 25, 1859 - attende by 725 adults and 75 children. I think that today we would be thrilled to get anywhere near that many people to come to anything. For those first Paulists, acting out of an abundance of zeal, that probably seemed like just a good start! Hecker's whole life was all about finding the God who is with us and helping others to do the same. Ultimately, that's what Christmas is all about and what the Christian life is all about in this interval between Christmas and the end. This year marks the 45th anniversary of that much loved Christmas TV classic, Charlie Brown's Christmas. It's a well done, beautiful, inspiring program in virtually every respect. The dramatic centerpiece of the story occurs when Linus explains the true meaning of Christmas by reciting Luke 2:8-14. The text is taken, of course, from the "King James Version," the 400th anniversary of whose publication will be coming up in 2011. And suddenly there was with the angel a multitude of the heavenly host praising God, and saying, Glory to God in the highest, and on earth peace, good will toward men. In 1965, that text was about as familiar as any in English literature. The "Authorized Version" (as the KJV is officially called) was just that - "authorized," an official translation of the Bible commissioned by King James I of England (James VI of Scotland) to use in the Established Church of England. While not the first English translation, its official status quickly catapulted it to become the most commonly used one among English-speaking Protestants. Four centuries - and many translations later - the KJV remains today the most widely read English translation of the Bible worldwide. What a tribute to the staying power of beautiful, uplifting English! Some perhaps might be tempted to dismiss the KJV's as excessively archaic for a modern audience (despite the fact that it is still the most read English Bible translation in the world). In fact, the KJV was always archaic - deliberately so. As I understand it, the translators used not the contemporary Jacobean English but the Elizabethan English of a generation earlier - familiar enough to be completely comprehensible but just archaic enough to sound special. Not just good English, but mildly archaic-sounding English was apparently seen as the vehicle for conveying something so special, so elevated, so sacred as the word of God. Growing up in a pre-ecumenical era, I was, of course, aware of the KJV from literature, movies, TV, and politicians' speeches, but I was much more familiar with the "Douay-Rheims" version of the Bible in English - the approved Catholic translation (which had actually undegone several translations and revisions since its initial late 16th century version). Based upon the Latin Vulgate, the Douay Bible differed noticeably from the KJV in certain spots famously, for example in its translation of the angelic hymn in Luke 2:14 - Glory to God in the highest, and on earth peace to men of good will. Even so, it shared with the KJV a special way of sounding that, while understandable, was obviously different from daily, pedestrian English and so conveyed sacredness by the very sound of the words. In the 45 years since Charlie Brown's Christmas first appeared, there have been many newer translations, some eminently scholarly, some primarily popular, which have tried to render the inspired text in accessibly contemporary English. I have no qualifications to assess the scholarly merits and linguistic accuracy of any of any of these various versions. As a consumer of scriptural and liturgical texts, however, I am quite aware of how a text sounds and whether it has the power to lift one beyond the contemporary and the pedestrian. Words really do matter. Since my first visit to Knoxville last June, I have occasionally murmured how our house's 3 front steps really need a railing or bannister. 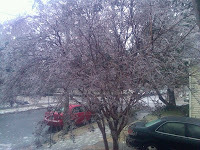 Sure enough, this morning I slipped on the ice-covered steps. (I'm somewhat sore, but otherwise I suspect I'm OK). The result of the ice storm, however, has been the cancellation of just about everything - including, regrettably, our parish staff Christmas party, scheduled ages ago at a Knoxville landmark restaurant. Since that restaurant is soon to go out of business, that's one Knoxville landmark I may never get to see! Naturally, I felt really bad about having to cancel our parish staff Christmas party, but there didn't seem to be much alternative. (Hopefully, we will soon find some other suitable occasion to be together without a work-related agenda). Meanwhile, I am spending the day here at home, doing very little. At least I've mailed most of my Christmas cards already! I still enjoy sending Christmas cards. Christmas presents are another story. I used to like buying presents - especially when my nieces were little and I could get them fun toys or really nice children's books. But now they too are grown up - grown enough to have their own tastes and preferences. So increasingly in recent years, the few gifts I give are just money (or at best a gift certificate, which is essentially the same thing but at least has more of the appearance of more personal effort having gone into it. Yet, while that certainly makes sense (and is certainly more convenient) I really do sometimes miss the experience of actually wrapping and giving a real present. There is something about gift-giving that just seems so congruent with this season. Of course, there still remain opportunities to give gifts to people who really need them. I think that is why "Giving Trees" have become so popular in recent years. In a world in which most of our charitable giving has been bureaucratized into cash donations (as with my personal gift giving probably the most efficient option really for both giver and recipient), "Giving Trees" provide an outlet for giving that is organized and efficient, but still preserves some sense of the personal. In the religious version of the secular "War Against Christmas," it is fashionable sometimes to denounce the "commercialism" and "materialism" underlying so much of our Christmas giving. Yet, as with much of our modern secular Christmas, there is something fundamentally good about our custom of gift-giving. "Giving Trees" and other such holiday practices help us anchor our annual shopping and buying spree somewhere closer to the heart of what this season is supposed to be all about. Surely one way to give thanks for God's Christmas gift of his Son to us his helplessly needy creatures is to give gifts ourselves not just to those who will respond with presents of equal or comparable value but especially to those who not only actually need the gifts they get but, being anonymous, will never even thank us, let alone reciprocate with more presents we really don't need. Be patient, says the letter of James from which we just heard [James 5:7-10], until the coming of the Lord. Now, whoever first picked that text to be read right at the mid-point of Advent probably was not intending to be ironic. For us who hear those words today, however, it may seem somewhat ironic to preach about patience in the middle of what has become, for most people, by far the busiest, most frantic time of the year. It is just one of the many paradoxes of our peculiarly post-natural, modern way of life that we manage to be busiest precisely at the very time of the year when everything else in nature is telling us it’s time to slow down. Winter is, among other things, nature’s way of slowing down. Note, for example, James’s reference to the farmer, who waits for the precious fruit of the earth, being patient with it, until it receives the early and the late rains. Back before modern technology made us think of ourselves as superior to and separate from the natural order of things, everything slowed down in winter. All sorts of activities came to a halt. Outdoor work and even wars stopped for the season. Of course, modern technology has made all these activities possible now even in winter – and indeed (if something is not done about it soon) may eventually even eliminate winter as we have known it. Folkloric customs, like our Advent Wreath, remind us that, when winter was really winter, people paused. The Advent Wreath likely originated in the once common custom of removing wheels form carts at the beginning of winter. The practice developed of decorating such a wheel with evergreen branches and candles. If the light of the candles has come to signify the bright light of Christ coming to penetrate the dark night of our present world, the wreath itself signifies our readiness to slow down enough to be able to see the light despite the winter dark. John’s problem (besides being in prison) was whether or not his life’s work had really made sense. John had confidently proclaimed the coming of God’s kingdom and had forcefully challenged people – including Herod – to repentance. Just how successful he was is hard to gauge, but he obviously had made an impression. He’d also acquired enemies powerful enough to put an end to his mission and put him in prison. He had, however, also made disciples, whom he now sent to evaluate Jesus. Jesus’ (somewhat indirect) answer was meant to reassure John, by recalling the biblical prophecies in which they both believed. Look, Jesus seemed to be saying, the things that are supposed to happen when the Messiah comes really are happening! What more evidence do you need? “Go, and tell John what you hear and see.” In other words, the reality of God’s kingdom is already happening – happening here, happening now! The Gospel gives us no record of John’s reaction to Jesus’ response. He departs the scene with his question. But it’s a question that the world keeps asking: Jesus, are you the one who is to come, or should we be looking elsewhere? There are, after all, a lot of other places one could look. And increasingly people – particularly younger people, but not just younger people – are doing just that. The contemporary world is a kind of spiritual smorgasbord, with lots and lots of choices and alternatives. But it’s also a world full of confusion and chaos, of broken lives and broken hearts. In such a world, John’s question cannot simply go away – unless, of course, one is prepared to give up and abandon hope entirely. That John was not willing to do, and people generally have not been willing to do. That is why Christmas is so important, now maybe more than ever. In the dark night of winter, full of fear, danger, and anxiety, in the long night of the present, haunting us, as yet another year comes to an end, with so many memories of lost opportunities, unfulfilled longings, and ruptured relationships, Christmas comes in answer to John’s – and our – question. It was as the historical spokesman for our hope – the perennial hope of men and women of every time and place – that John in prison posed his question, a powerful question, a question the world keeps on asking. To us, as to John, Jesus challenges us to pay attention, and so to hear and see the signs – the powerful signs – of God’s presence and action in our lives and in our world, enabling and inviting us to live in hope, as people of hope. And because it is we (who continue Christ’s life and mission in the world as his Church), we, who are now the voice of Christ for the world to hear and the face of Christ for the world to see, it is we who are being asked John’s question and we who must answer it by the witness of our own hope – hope for ourselves and hope for the whole world. Say to those whose hearts are frightened: Be strong, fear not! Here is your God … he comes to save you [Isaiah 35:4]. Homily for the 3rd Sunday of Advent, Immaculate Conception Church, Knoxville, TN, December 12, 2010. Today the Church celebrates the memory of St. Juan Diego. Born Cuauhtlatoatzin (“Talking Eagle”), he took the Christian name Juan Diego at his baptism. 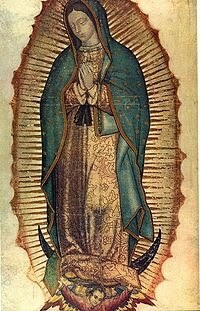 On December 9, 10, and 12, 1531, the Blessed Virgin Mary (since then invoked under the title Our Lady of Guadalupe) appeared to Juan Diego on Tepeyac hill, near the old Aztec imperial city Tenochtitlan (now Mexico City). The famous image, which miraculously appeared on Juan Diego’s cloak (tilma), has been venerated ever since in the magnificent shrine in Mexico City near the site of the event. In 1988, in the course of a summer spent studying in Guadalajara, I had the privilege of venerating the miraculous picture of Our Lady of Guadalupe in the Basilica in Mexico City. Fifteen years later, in 2003, I was present in New York’s St. Patrick’s Cathedral when a small, half-inch square relic of St. Juan Diego’s tilma was exposed for veneration. The only known such relic in the United States, it was originally a gift from the Archbishop of Mexico to the Archdiocese of Los Angeles in 1941, and in recent years has been displayed in various U.S. cities in commemoration of Juan Diego’s canonization in 2002. In 1531, Mary asked for a church to be built. Almost immediately, the Church began to be built among the peoples of this continent, calling and forming disciples throughout North and South America. Under the patronage of Our Lady of Guadalupe, the building of the Church continues on this continent - inspired by the example of St. Juan Diego to be constantly more evangelizing and more missionary. It was my one of the first phone calls I received at my first assignment after seminary. On the line was someone wanting advice - because the Devil was throwing books at him. At first, I felt totally at a loss how to answer. Nothing in my training had, I thought, prepared me for this. I remember thinking to myself, “I hope at least they are paperbacks,” which thankfully I didn’t say out loud and which would probably not have been very helpful if I had. As we talked, however, it became obvious to me what the right answer really was – namely, that in Christ God has already defeated the Devil, decisively defeated the Devil. For God is more powerful than anything we can throw at him – or the Devil can throw at us. God is more powerful than sin. And that is essentially what we celebrate today on this great festival of the Immaculate Conception of the Blessed Virgin Mary, the patronal feast of our historic parish. Our tainted nature’s solitary boast. The story we just heard from the Old Testament [Genesis 3:9-15, 20] highlights the serious damage done by Adam and Eve to themselves and to the whole rest of the world. Adam and Eve symbolize and represent all of us and the damage all of us have continued to do to ourselves and to our world, through our sinful alienation from God. Mary, however, holy Mary, represents the healing effect of God’s far-greater power – and his powerful plan to save us form ourselves. The story calls Eve the mother of all the living. In spite of sin, human life continued – the very first sign that God is not ready to give up on us. Of course, the serpent still lives and continues his mischief, but his doom is already certain. He (Eve’s greatest descendant and Mary’s Son) will strike at the serpent’s head and crush him. God’s great plan for our salvation, the mystery decided upon from all eternity and hidden for so many centuries, has been realized in Mary’s Son, Jesus, and is now revealed in the life and mission of the Church. Mary’s holiness at the very beginning of her earthly life is the Church’s holiness at its beginning and invites us to look forward to the Church as it will one day be in the perfect holiness of God’s kingdom. O Mary conceived without sin, pray for us who have recourse to you! Homily on the Immaculate Conception of the Blessed Virgin Mary, Immaculate Conception Church, Knoxville, TN, December 8, 2010. This morning, as snow is falling on Knoxville, our parish Christmas Tree stands in front of the Church – dark, but standing. Tomorrow, December 8, I will bless it and then the lights will be turned on. Given the church’s prominent location – at the summit of "Summit Hill" – an outdoor Christmas Tree seems like such an obvious thing to do. The flip side of being at the top of a hill, however, is the wind, which has already blown the tree down. But we got it up again, and have it anchored all that much more securely, so as (we hope) to guarantee that it won’t fall over again! The city had its Christmas Parade this past Friday. But we are waiting until Wednesday to light our tree because, of course, December 8 is the solemnity of the Immaculate Conception of the Blessed Virgin Mary, the patronal feast of the United States and of this - the first - Catholic parish in Knoxville. The Immaculate Conception celebrates our belief - as an article of Catholic faith - that “the Most Blessed Virgin Mary, from the first moment of her conception, was, by the singular grace and privilege of Almighty God, in view of the merits of Christ Jesus the Savior of the human race, preserved immune from all stain of original sin” (Blessed Pope Pius IX, Ineffabilis Deus, 1854). When the Church defines a truth as “revealed by God,” this does not suggest some new revelation but bears witness to what has been revealed from the beginning and has been transmitted over time through the tradition of the Church. In reference to the Immaculate Conception, scripture and Church tradition affirm that the grace of God filled Mary’s life from the beginning. In view of her vocation to be the mother of Christ, we recognize that Christ’s redeeming work was effective in Mary in the depths of her being and at her earliest beginnings. Mary’s sinless conception prepared her for her special role in Christ’s coming into the world, and thus helped to prepare the world for that great event. This harmonizes especially well with the salient themes of the Advent season - preparing ourselves and the world for Christ’s return and disposing ourselves to recognize his presence among us here and now by contemplating his first coming into the world at Christmas. Meanwhile, here in East Tennessee in 1855, the first Catholic Church in Knoxville was erected on Summit Hill and dedicated to the Immaculate Conception. For 155 years, a Catholic Church has stood on this hill as a vivid sign of the Church’s outreach to all who live, work, or visit within sight of its tower. May our parish Christmas Tree, which will be lit in time for Wednesday evening’s festive Mass, be a beacon highlighting this parish's mission - the Church’s mission - to illuminate our world with Christmas grace. For us today, John seems a somewhat mysterious, elusive, and probably not very attractive figure. He appears, ever so briefly, at the beginning of Jesus’ public life. Then, before we have barely gotten to know him, he’s gone. From the little we do know, however, he comes across as the sort of person who may be much admired, but preferably from a safe distance – and after he is safely dead. So having heard his rather shrill shouting every 2nd Sunday of Advent, we are ready right away to put him back in storage, so to speak, while we focus instead on the more charming sounds of the holiday season. This is the season to be jolly, after all. And no one ever called John “jolly”! We, of course, expect our celebrities to be good-looking and to wear the right kind of clothes. I suspect that most of us, were he to be transported into our time, might be tempted to treat him like any other odd-looking character, standing on the street haranguing us about the end of the world or whatever. Most likely, we would ignore him. Matthew, however, says that at that time Jerusalem, all Judea, and the whole region around the Jordan were going out to him and were being baptized by him in the Jordan River as they acknowledged their sins. Even the religious professionals, the Pharisees and Sadducees, took an interest – although all they got in return was to be denounced as a brood of vipers. Poor Pharisees and Sadducees! As the old saying goes, no good deed goes unpunished! I really wonder how effective John’s approach was with the Pharisees and Sadducees. Like them, most of us respond better to positive reinforcement. Most of us would probably shy away from John’s message. Most of us, in fact, prefer our religion to be as predictable and comfortable as possible. John, however, had a whole other agenda, which is why we hear him in Advent. In a sense, John’s entire life was like one long Advent! Of course, it’s easy for Advent to pass us by, overshadowed as it is by all the activity connected with Christmas. Overshadowed or not, however, Advent is a very special season, Christianity is, after all, a very historical religion, that takes time very seriously. We believe that time has a beginning, a middle, and an end. The beginning, of course, was creation. The middle, not necessarily mathematically, but religiously the center of all history was when God became personally a part of human history in Jesus. Everything since then, however long, constitutes the last phase of human history – everything since Jesus’ return to his Father and his gift of the Holy Spirit to the Church to continue his presence and action in the world. We don’t know how long this final phase of history will last. The point is not pinpointing the date of Christ’s 2nd coming (as many have tried to do and many would like us to be able to do), but rather what happens in this interval between Christ’s 1st coming at Christmas and his final coming for which we wait – as we say every day at Mass – in joyful hope. What we do in this interval between Christmas and the end is what living a Christian life ultimately comes down to. So each one of our lives, like the life of John the Baptist, has to be thought of as in a sense one long Advent. John told those Pharisees and Sadducees: “Produce good fruit as evidence of your repentance.” In other words, make good use of this time that we have been given. Advent is about re-examining our lives and allowing God to reshape us. It’s a process we dare not avoid, lest we get stuck in the same rut as the Pharisees and Sadducees. God is still very much at work in our world. His great plan for the world – and for each one of us – is still enfolding. So John the Baptist appears on the scene very Advent to tell us it’s time to get on board, to re-examine our lives, and so be ready to participate in the glorious new world which God has already begun building. Homily for 2nd Sunday of Advent, Immaculate Conception Church, Knoxville, TN, December 5, 2010.